President Donald Trump speaks at Joint Systems Manufacturing Center in Lima, Ohio, Wednesday, March 20, 2019. "McCain didn't get the job done for our great vets," Trump said Wednesday. "I got it done." Actually, McCain got it done. 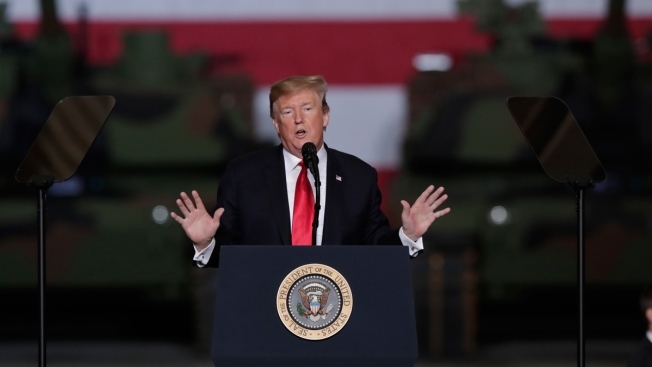 Trump routinely takes full credit for enacting the Choice program, suggesting he had fulfilled a campaign promise to provide private-sector care for veterans while ignoring the fact that it was signed into law by President Barack Obama in 2014. This time, his boast came as part of a broad-brush denunciation of McCain, the senator from Arizona, Vietnam war naval aviator and tortured prisoner of war who died in August of brain cancer. TRUMP: "The vets were on my side because I got the job done. I got Choice, and I got accountability. ... For many decades, they couldn't get it done. It was never done. I got it. Five months ago, I got it done. Choice." — remarks at an Army tank factory in Lima, Ohio . THE FACTS: What Trump got done was an expansion of the program achieved by McCain and Sen. Bernie Sanders, most prominent among the lawmakers who advanced the legislation signed by Obama. McCain was a co-sponsor of the 2014 legislation to overhaul the Department of Veterans Affairs following the scandal at VA's medical center in Phoenix, where some veterans died while waiting months for appointments for medical care. He was a key negotiator for the legislation establishing the Veterans Choice program, working with Sanders, the co-author of the bill. Sanders was then chairman of the Senate Veterans Affairs Committee. TRUMP: "Instead of waiting in line for two days, two weeks, two months, people waiting on line — they're not very sick, by the time they see a doctor, they are terminally ill — we give them Choice. If you have to wait for any extended period of time, you go outside, you go to a local doctor, we pay the bill, you get yourself better, go home to your family — and we got it passed. We got it done."